Dylan Harrison stands in front of his truck that was seized by the DEA after his arrest in 2012. When Harrison got his truck back, he found that it was severly damaged. 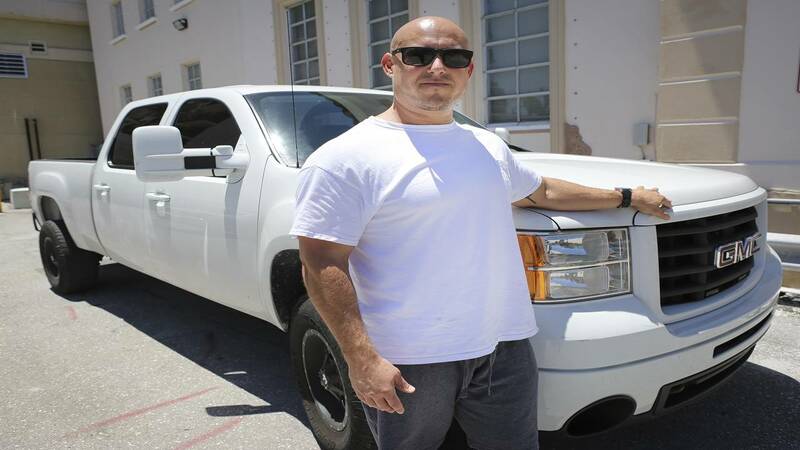 WEST PALM BEACH, Fla. - A South Florida police agency is being sued after one of its officers broke into a suspect's truck and swapped out a custom-modified part with the officer's factory part while the Lantana man was still in jail, according to a federal lawsuit obtained by Local10.com. Dylan Harrison filed the lawsuit last week against the West Palm Beach Police Department, Officer Sean Meyers, Griffin Auto Care Inc. and its owner. Harrison was arrested by the DEA in July 2012 on charges of conspiracy to distribute a controlled substance. Meyers was assigned to Harrison's case as part of a DEA task force. According to the lawsuit, Harrison's 2010 GMC pickup truck was among the items seized by the DEA after his arrest. DEA agent David Weeks visited Harrison in jail a month later to tell him that someone had broken into the truck while it was parked in the DEA seizure lot. Believing that Harrison might have been involved in the burglary in an effort to discard any possible evidence inside, Weeks questioned Harrison about the theft. Harrison said he had "no idea" who was responsible. As part of a plea agreement, the DEA agreed to return Harrison's truck to him because it was purchased "well before any alleged criminal activity." When Harrison tried to retrieve his truck in April 2013, he learned that it had been moved to an auto auction company, "even though Harrison was still only under indictment and had not admitted guilt yet," the lawsuit said. Harrison traveled to Apple Auctioneering Co. and found what he called severe damage to the interior and exterior of his truck. According to the lawsuit, there was a flat tire, a broken window and a broken door panel. The trim and body were dented, the seats were cut up and the radio had been ripped out, "replaced with a cheap substitute that did not fit and hung out of the dash." Several of Harrison's personal items were also missing, including power tools and a Tiffany gold chain with a diamond pendant, the lawsuit said. When Harrison took his truck in for repairs, the mechanic who had done the original modifications noticed that the intake was missing and replaced with a cheap factory model. The lawsuit alleges that the factory intake part's vehicle identification number came from a truck registered to Meyers. "Later, investigation revealed that Harrison's high-performance Bank Power intake was installed on Meyers' truck," the lawsuit said. 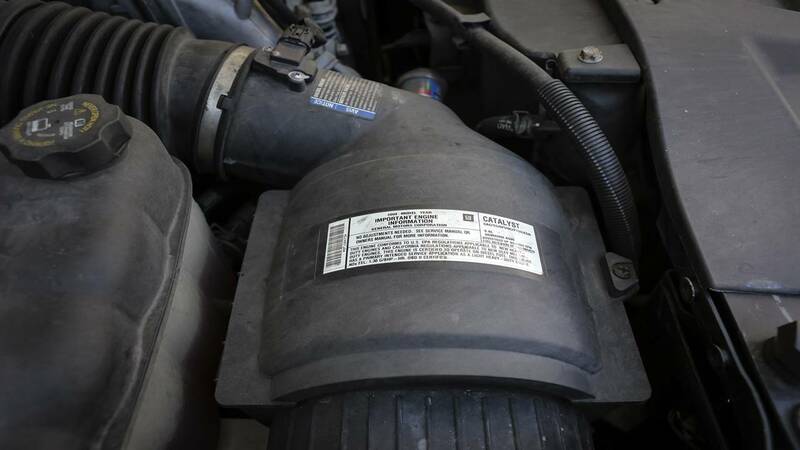 The VIN on this intake in Dylan Harrison's truck was registered to West Palm Beach police Officer Sean Meyers' truck. According to the lawsuit, Meyers had Harrison's truck towed to his friend's auto repair shop. It was at Griffin Auto Care that "Harrison's expensive high-performance parts were switched for Meyers' cheap factory parts." The lawsuit alleges that Meyers "unlawfully seized property" from Harrison and seeks damages in excess of $15,000 from the city of West Palm Beach. The lawsuit also seeks unspecified damages from Meyers, William Griffin and his business. Not only did Griffin swap the parts, but he also caused "extensive damage to the body of Harrison's truck in putting the truck on the lift to do the work," the lawsuit said. "Harrison suffered damages from Griffin's tortious conduct," the lawsuit said. However, Griffin, who is a retired West Palm Beach police officer, told Local10.com that he isn't a thief. "I didn't steal anything," Griffin said. "I wouldn't steal anything." Griffin said he was just doing what he was asked to do, but he said it wasn't Meyers who asked him. "He had nothing to do with it," Griffin said. Still, Griffin doesn't deny that it happened. He said the DEA brought him Harrison's truck and he was essentially told to do whatever he needed to do to make the truck work again. Griffin said he thought he was simply retrofitting an impounded truck to become an undercover vehicle. "Nobody gained anything by what occurred," Griffin said. Griffin said the last part needed to get the truck working again was an intake. He said Meyers' truck was at his shop, so he called his friend and asked if he could take the part from his truck to put into Harrison's truck. "Why would I put a known, traceable part into somebody else's truck?" Griffin asked. Griffin said that was the extent of Meyers' involvement, and he took responsibility for dragging Meyers into it. According to a June 2015 report by the Palm Beach Post, Meyers has been on leave since January of last year. Local10.com requested Meyers' personnel file and the status of his employment with the West Palm Beach Police Department but has not yet received the documentation. The lawsuit seeks a jury trial to award "appropriate compensatory damages."